practice room. Please turn off cell phones and pagers. 2. Wear modest clothes that allow you to move and breathe freely. No baggy clothing, instructor needs to see alignment. No heavy jewelry. NO PERFUME OR COLOGNE. 3-4 hours after a heavy meal. 4. Avoid using any scents when coming to class, respect those who are allergic and sensitive to perfume. arrive on time to your class(es). you learned in class on your own while you remember them. yourself to practice at the same time whether it is once a day or once a week. 3. Consult your instructor about modifications for menstration, high blood pressure, & specific health concerns and injuries. 4. Be systematic in practice, begin with the simpler postures and progress to the more complex as your strength, flexibility and understanding of the postures develop. 5. 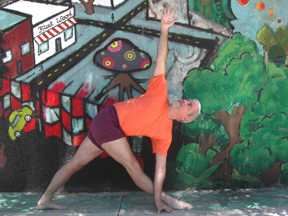 Yoga can be practiced anytime of day, practice with an empty stomach, bladder and bowels. Wait 4 hours after a heavy meal. 1-2 hours after a light meal before beginning to practice. 6. Breathe through your nose as you practice. Keep your mouth closed and eyes open. 7. To avoid injury do not force your body into any pose, beyond its capacity. 8. It is best to attend a yoga class on a regular basis to get individual corrections from a teacher, and to gain a deeper understanding of the postures.